This adventurous 7-night Kenyan safari takes guests from the bustling capital city, Nairobi, to the best game reserves Kenya has to offer. After 1 night in Nairobi, guests will be transferred to the Samburu National Reserve, which is where the famous film "Born Free" is based and it is known to boast a wide variety of animal and bird life. Next, guests move to Lake Nakuru National Park. It is best known for its thousands, sometimes millions of flamingos nesting along the shores. Finally, guests will spend their last 2 nights in the Masai Mara National Reserve, famous for the Great Wildebeest Migration during the months of July to October; and also for its exceptional population of lions, leopards and cheetahs. From US$3120 in Low Season to US$3795 in High Season per person sharing. Upon arrival at Nairobi International Airport, guests will find themselves in the capital city of Kenya, and at the start of their week-long safari. From here, guests will be transferred by road to their night's accommodation at the Southern Sun Mayfair Hotel. There is a host of activities for guests to engage in while they spend time in Nairobi a visit to the Karen Blixen Museum, an afternoon at the Giraffe Centre, a visit to the Daphne Sheldrick Animal Orphanage, shopping excursions and Kazuri Beads to purchase beads and pottery. A traditional warmth and hospitality makes this large hotel a welcoming and comforting place to overnight before setting off on an exploration of Kenya's wildest Parks. After breakfast at the Southern Sun Mayfair Hotel, guests will be transferred by road into the Samburu National Reserve for the first leg of their safari tour. 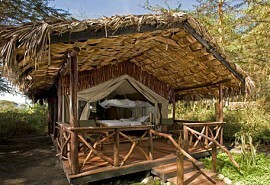 Situated on the banks of the Ewaso Nyiro River, in heart of the Samburu National Reserve, is the Elephant Bedroom Camp. This is where guests will spend the following 2 nights of their itinerary and where they can enjoy a unique African safari experience in a luxury, tented setting. Stay in spacious tents that are surrounded by doum palms and other beautiful indigenous trees which attract almost-daily visits by a herd of elephant. Guests will go on early morning and afternoon game drives to explore the incredible Samburu National Reserve, well known for its lion and leopard sightings. After an early start on the fourth morning spent on safari in the Kenyan wilderness, guests will embark on a road trip into Lake Nakuru National Park where they will set off on an early morning game drive and nature walk. Tucked away in the spectacular vastness of The Great Rift Valley in the 6400 acre private Congreve Conservancy, Mbweha Camp is nestled up against the southern border of Lake Nakuru National Park with beautiful views of the Eburu and Mau Ranges. Mbweha Camp consists of 10 cottages built of lava stone with thatched makuti roofs, which add glamour and style to its contemporary African ambience. Bush walks, night game drives, bush breakfast and hot air ballooning over the spectacular Great Rift Valley and the lakes below are additional activities that can be enjoyed during this stay in a truly remarkable and authentic African setting. 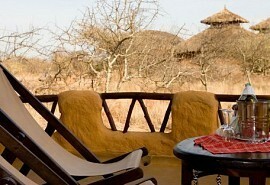 On the sixth morning, guests can look forward to moving onto the Masai Mara. Transferred by road after an early awakening at the previous camp, guests set off for Tipilikwani Mara Camp, which is located on the River Talek. Accommodation at Tipilikwani Mara Camp for the last 2 nights is in 20 insect-proof tents offering pure luxury, with ensuite bathrooms and hot and cold water facilities. Situated just outside the gates of the Mara Reserve, the heightened perspective of the lodge projects views of the surrounding plains that are frequented by an almighty population of Africa's big cats. 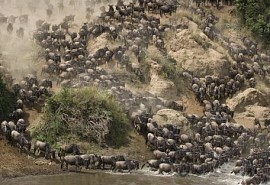 Once a year, the migration of the wildebeest and the zebra takes place on this famous landscape.